THEJO are the leaders of conveyor belt splicing services in the subcontinent, offering Hot and Cold Vulcanisation of Belts Conveyors. We offer a range ofConveyor Belt Decoiler, that are widely acknowledged for their excellent abrasion resistance and long service life. These products are used in different machines for decoiling scrap and other materials. Owing to their effective operation, these products have gained a high demand among our clients. We have experienced technical team with world Class tools and tackles, we are specialist in Belt laying, Belts Jointing, Belt Repairing (Nylon and Steel Cord Belts) and Pulley Drum Rubber Lagging by Hot and Cold Process. 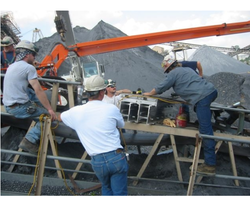 Established as a n eminent service provider, we are offering Conveyor Belt Repair Services. Employing modern tools and machines, these repairing services are rendered with perfection in tandem with the guidelines laid in the industry. In addition, we are rendering these services at industry leading prices. We Sri Dharshini Enterprise can rework/service the possible damaged conveyor belt on site till some width and on factory a large width of belts. All Types of Rubber Belt Repair & jointing with quick, fast services. Best quality of Conveyor Belts Repair Service is provided by us to customers as per their requirements. We hold expertise in rendering Belt Repairing Service. Our Belt Repairing Services are extensively recommended by clients owing to our punctuality and reliability. We make use of best available paints and latest techniques to render these services. Our services are acclaimed for punctuality, reliability and long lasting finish.